Sorry it has taken me some time to update this website, it has been an exciting time in Ski Jumping and in my own personal career. I finished up a decent season in March when I returned home from an European tour of competitions. The highlights of last winter's season included a strong finish at the Iron Mountain Continental Cup and a return trip to the Ski Flying World Cup at Planica, Slovenia. Overall I was happy with my winter 2012 season, but recognize that it took me a while to find my confidence and that is something that I hope to work on for the summer season, continuing into next winter's season. After finishing up the winter season I returned home to Saranac Lake, NY for some rest and relaxation. While on this break from competing I took some online classes through DeVry University and also worked at the Tail O' The Pup restaurant in Ray Brook, NY. I continued to train in the gym and even got some late spring hill time with Casey Colby in Lake Placid. Towards the end of June I headed to Park City to train for a few days with teammate Anders Johnson and coach Clint Jones. I then left for Europe, feeling confident and ready for some action. So far this season is playing out well. I have experienced consistency in my jumping and am happy with my performance. My first two weekends of competition in Stams, Austria and Kranj, Slovenia were very exciting. I achieved a top ten finish both weekend, and consider that an excellent base for the season. We will be traveling throughout Europe for the next couple of weeks competing in various Continental and FIS cups and will be making an appearance at the Grand Prix in Wisla, Poland next week (7.16-7.17). At the end of July I will be returning home for a few days before making my way to Park City for US Nationals which will take place the first week in August. The fall and winter schedules are still up in the air and are dependent upon how all the team members compete this summer. 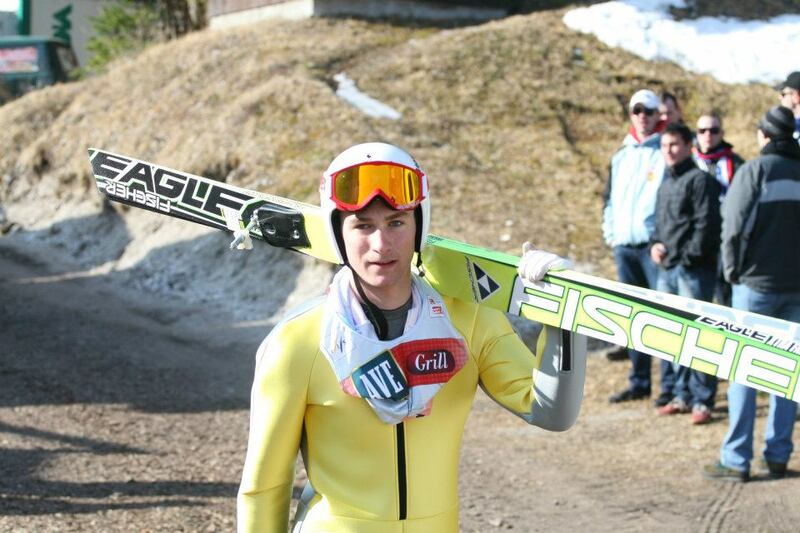 Another interesting thing has been happening in the world of ski jumping, and that is a new suit rule. Until now our jumping suits have been designed with a 6 cm allowance, which means that at any point there can be 6 cm between the body and the interior of the suit. I realize that six centimeters doesn't sound like a lot, but it can give quite the advantage when it comes to wind resistance, and thus longer flight times. This season it has been decided to do away with the suit allowance so that every jumping suit must be skin tight to the competitor. This certainly helps level the playing field, and I look forward to seeing how this new rule affects this season's competitions. I will keep you posted on my whereabouts over the coming weeks, and as always thank you for your continued support. We are working on an exciting fundraising event in my hometown of Saranac Lake for this Columbus Day weekend, so keep checking back for updates on that!